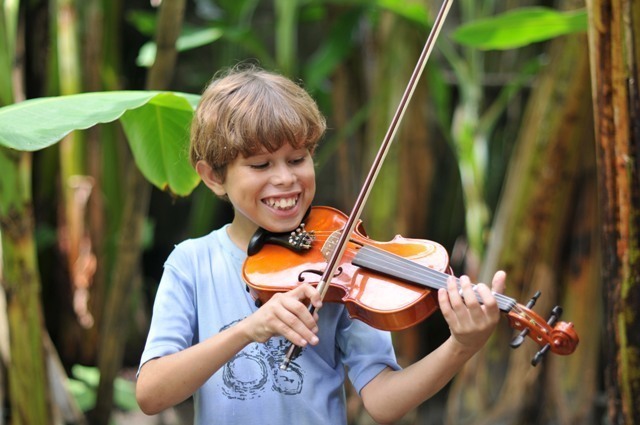 A musical talent has been discovered in Rafael, a pupil at our Centre Educativo Cristiano School in Colombia, after he joined a violin music group and in just a few short months of learning a new instrument, he has been promoted to leader of the class! The group is now going strong with eight very dedicated students who are motivated and keen to learn the violin. The school has seven instruments so the children visit each other’s homes to practice; this has not dampened their enthusiasm, but encouraged their team work. Rafael, like many of our students at the Stand by Me school, comes from a background of hardship and extreme poverty. He lives with his twelve family members in a small, two roomed block house. Rafael’s father left the town of Guacamayal many years ago to find work, and despite receiving some money from him regularly, they struggle to find their daily food. Rafael is from one of the poorest families at our school, and it is thanks to our sponsorship programme that he has been given the chance to gain a good education and unlock his hidden musical talent. At Stand by Me we believe every child has the right to a brighter future and we want every child to have the opportunity to discover their talents. You can read more about how to help children like Rafael through in our child sponsorship section.